EAST RUTHERFORD, N.J.-04/08/2019- WWE® (NYSE:WWE) announced tonight that WrestleMania 35 broke the record for MetLife Stadium’s highest-grossing entertainment event. 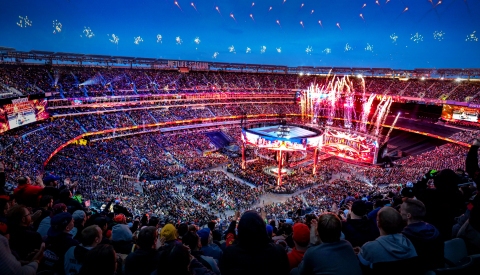 WWE’s annual pop-culture extravaganza grossed $16.9 million, surpassing the venue’s previous record of $12.3 million set by WrestleMania 29 in 2013 as a sold-out crowd of 82,265 fans from all 50 states and 68 countries converged on MetLife Stadium. WrestleMania 35 was the second highest-grossing event in WWE history, only behind WrestleMania 32 at AT&T Stadium in Texas. As part of the weeklong WrestleMania celebration, WWE will host five consecutive nights of events at MetLife Stadium in East Rutherford, NJ and Barclays Center in Brooklyn. WrestleMania 36 takes place on Sunday, April 5, 2020 from Raymond James Stadium in Tampa Bay, FL. Ticket information will be announced later this year. WWE, a publicly traded company (NYSE: WWE), is an integrated media organization and recognized leader in global entertainment. The Company consists of a portfolio of businesses that create and deliver original content 52 weeks a year to a global audience. WWE is committed to family friendly entertainment on its television programming, pay-per-view, digital media and publishing platforms. WWE’s TV-PG, family-friendly programming can be seen in more than 800 million homes worldwide in 27 languages. WWE Network, the first-ever 24/7 over-the-top premium network that includes all live pay-per-views, scheduled programming and a massive video-on-demand library, is currently available in more than 180 countries. The Company is headquartered in Stamford, Conn., with offices in New York, Los Angeles, London, Mexico City, Mumbai, Shanghai, Singapore, Dubai, Munich and Tokyo. Forward-Looking Statements: This press release contains forward-looking statements pursuant to the safe harbor provisions of the Securities Litigation Reform Act of 1995, which are subject to various risks and uncertainties. These risks and uncertainties include, without limitation, risks relating to: WWE Network; major distribution agreements; our need to continue to develop creative and entertaining programs and events; a decline in the popularity of our brand of sports entertainment; the continued importance of key performers and the services of Vincent K. McMahon; possible adverse changes in the regulatory atmosphere and related private sector initiatives; the highly competitive, rapidly changing and increasingly fragmented nature of the markets in which we operate and greater financial resources or marketplace presence of many of our competitors; uncertainties associated with international markets; our difficulty or inability to promote and conduct our live events and/or other businesses if we do not comply with applicable regulations; our dependence on our intellectual property rights, our need to protect those rights, and the risks of our infringement of others’ intellectual property rights; the complexity of our rights agreements across distribution mechanisms and geographical areas; potential substantial liability in the event of accidents or injuries occurring during our physically demanding events including, without limitation, claims relating to CTE; large public events as well as travel to and from such events; our feature film business; our expansion into new or complementary businesses and/or strategic investments; our computer systems and online operations; a possible decline in general economic conditions and disruption in financial markets; our accounts receivable; our revolving credit facility; litigation; our potential failure to meet market expectations for our financial performance, which could adversely affect our stock; Vincent K. McMahon exercising control over our affairs, and his interests may conflict with the holders of our Class A common stock; a substantial number of shares which are eligible for sale by the McMahons and the sale, or the perception of possible sales, of those shares could lower our stock price; and the relatively small public “float” of our Class A common stock. In addition, our dividend is dependent on a number of factors, including, among other things, our liquidity and cash flow, strategic plan (including alternative uses of capital), our financial results and condition, contractual and legal restrictions on the payment of dividends (including under our revolving credit facility), general economic and competitive conditions and such other factors as our Board of Directors may consider relevant. Forward-looking statements made by the Company speak only as of the date made, are subject to change without any obligation on the part of the Company to update or revise them, and undue reliance should not be placed on these statements.